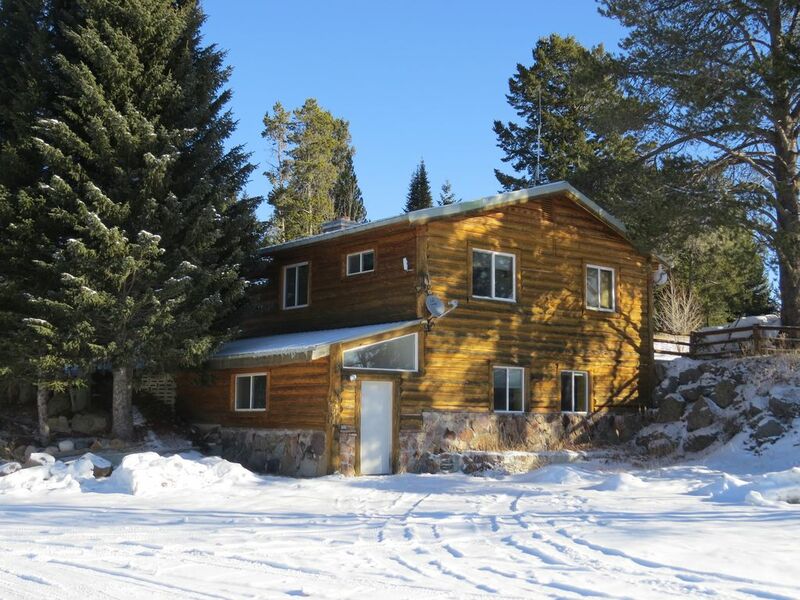 If you’re looking for lodging near Yellowstone, the Brook Trout Home is located just 8 miles from the West Yellowstone Entrance and has accommodations for large groups up to 10 with the option of adding on the lower level bedrooms for sleeping up to 18 people total. The upper level has 3 bedrooms that sleep 8 (2 bedrooms with queen beds plus 2 full beds in the third bedroom) plus a sofa sleeper that sleeps 2 more. There are also 2 full bathrooms. The Yellowstone area is a very diverse vacation destination. It is the perfect place to experience a memorable family or group vacation! * Wildlife Viewing – of course! All linens and towels are provided . Beautiful large rock fireplace -- wood provided! Fully equipped kitchen with many small appliances and spice rack. One main dining table plus an additional smaller table also in the dining area. Kayaking, canoeing and rafting gear are available for renting from local outfitters. Ski-in, ski-out for cross country skiing & snowshoeing plus numerous trails right here in West Yellowstone. And downhill skiing & snowboarding are a fun day trip to Big Sky, just 45 minutes away. There are tennis courts open to the public located at the Island Park Village resort, just 12 miles away. There's a great 9-hole golf course located at the Island Park Village resort, just 12 miles away. A charming vacation cabin with all the comforts of home. We loved the location of the cabin, nestled in the trees. The open floor plan and fireplace offered room for all eleven of us to relax and visit. The grandkids loved playing foosball and the beds are very comfortable. The kitchen is well stocked with appliances and some cooking supplies. We enjoyed staying here and only wished we could stay longer. This house is pretty good. We eight gays like it very much. Especially the full kitchen which guarantees our picnic food. We loved our stay at the Brooktrout inn. It’s very close to the park. It was very roomy so if you have a lot of people and want to all stay together, it’s an excellent option. It has a large dining table and lots of amenities for cooking. We didn’t use the grill but there was one. We brought our own dvd’s so we watched a movie and loved playing foosball! It has comfortable sofas that recline! Convenient to West Entrance of Yellowstone. We saw mule deer, fox, and an osprey from the dining room. Owner was helpful with my questions. Would love to come back with more of my family. Best reunion spot you will find! I coordinated a very large family reunion in West Yellowstone last month (7/16). Due to the number of people I had, I actually reserved three of Bills properties (Kozy Cabin which is right next door, and Bull Elk which is a few blocks away) but the Brooktrout Inn was our "gathering place," and it was spectacular! As other reviewers said, the pictures don't do it justice. One thing I didn't think to take into consideration was parking, and this place had plenty. Bill was very accommodating and friendly. I could go on and on but will just say that if you are looking for a place to stay in West Yellowstone look no farther! We booked the Brook Trout Inn a year ago while planning a family vacation to West Yellowstone. There was a combination of four siblings and their families ages 17-63 Due to different travel arrangements we had to change our dates. Bill was awesome to work with. He always responded promptly. The pictures really do not do the Inn justice. There are not pictures of the second level which included three additional bedrooms. Two with queen sized beds and one with two queen beds and an attached bathroom. There is also another bathroom in the second level and a small living room with a tv. ( great area for the young adults in the group to hang out) There is also a room that goes to the outside which we were able to keep additional food in and xc skis etc....We booked both levels as there was 14 of us. We had plenty of room. The house is extremely well stocked, in fact we actually brought too much. There is everything from new spices, roasting pans, crock pots and a rice steamer. There is Internet and satellite tv which was perfect to catch the football games that were on. The fooseball table was a big hit. There were plenty of towels, and a hair dryer. We had extremely cold temperatures and Bill was kind enough to get a couple of extension cords so that we could plug in our vehicles. I really can't say enough great things about the property. Bill also was able to tell us great places to go xc skiing and recommended a local guide company Back Country Adventures to take us into the park to Old Faithful. The location of the cabin is about 7 miles from town so we were able to have a very rural feel yet close enough to the store if we needed something. We loved it so much we booked again for next year. Thank you Bill for a great place for our family to stay and build some amazing memories. Please call to ask about the additional fee and cleaning for 2nd floor -- it's a great deal and sleeps another 8 people! All of our rates are seasonal, which means we technically do not have a "standard rate." So if you are booking over a year in advance, please contact us for accurate pricing as those seasonal rates may not have been added yet. Also, note that the off season rates do not apply to holiday seasons. Please feel free to contact us with any questions regarding rates.